Nicole Richie featured on Regis and Kelly yesterday morning and she was wearing a beautiful paisley print parachute style dress. 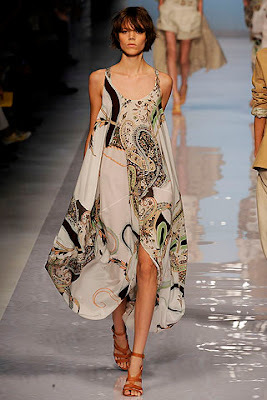 This long paisley bubble hem dress is by Etro. The sleeveless dress has a scoop neckline and a loose oversized fit. The dress is printed in an oversized paisley pattern in browns and greens. It has a split at the centre front below the knee and has two concealed side pockets. It is currently sold out but you can usually purchase it from farfetch.com for £1575. The question is, who wore it better.. I just blogged about this dress, too! It's rare that a high-fashion dress like this looks much better in real life than on the catwalk!